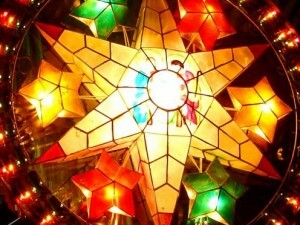 Home » Monthly Cultural Feature » Maligayang Pasko! With Christmas coming up, you might be interested how Filipinos celebrate this beloved holiday. send your comments on your favorite Filipino christmas traditions ! How Do Filipinos Celebrate Christmas? So how do Filipinos really celebrate Christmas? Go a�?karolinga�? or serenade neighbors, friends and benefactors with Christmas carols to spread holiday cheers. Attend “Simbang gabia�?, which is a daily Mass for nine days, held at dawn, beginning December 16. When available, eat puto bumbong (sticky rice steamed inside a “bumbong,” or small bamboo tube), “bibingka” (rice cake with salted eggs and fresh coconut meat) and “suman” (steamed rice wrapped in banana leaves) outside the church. Wash them down by drinking steaming a�?salabata�? (ginger brew), tsokolate ( native chocolate drink) or coffee. In the provinces, watch the “Panunuluyan” in the town plaza on Christmas Eve. This is a re-enactment of Joseph and Marya��s journey to Bethlehem to portrays the difficulty they encountered along the way and the joyous birth of Jesus Christ. Gather with friends and relatives for “Noche Buena” at midnight, and feast on a�?jamona�? ( ham ), a�?quezo de bolaa�? ( quedam cheese ball ), bibingka ( rice cake ) and sopas ( soup, normally with macaroni noodles ) and pandesal (soft bread) or a�?tastya�? ( sliced bread ) This festive meal is followed by the exchange of gifts. Arrange to visit family and friends on Christmas Day. Eat a�?Noche Buenaa�? leftovers. Exchange more gifts. Tease your friends by trying to borrow money and playing pranks on December 28, the a�?Ninos Inocentesa�? or Feast of the Innocenta��s Day. Buy round fruits and dress in clothes with lots of circles (circles to represent money) and carry some cash on New Yeara��s Eve to bring riches in the coming year. Just before midnight, make lots of noise to drive away the bad luck and the Old Year, and light a�?lusisa�? (sparklers), a�?kwitisa�? (fireworks) and a�?rebentadora�? (firecrackers, mini-bombs) to welcome good luck and the New Year. Gather again with friends and relatives for “Noche Buena” after midnight to feast on a a�?lechona�? ( roast pig ), a�?lechon manoka�? (roast chicken) and other delicacies. This sumptious first meal will hopefully bring more good meals throughout the New Year.